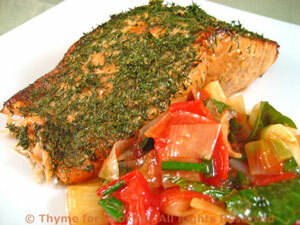 Salmon, Warm Tomato Leek Salsa, Thyme for Cooking easy gourmet dinner. We're having an asparagus salad as the vegetable with this dinner - or you could have it as a first course.... Easy summer cooking. I often fix this as a vegetable for a Chinese Dinner but, since I now have some lettuce in my garden, I thought to pair it with some eggs and cherry tomatoes for a first course salad. You could substitute avocado for the asparagus, or just use more greens. Wash and spin dry the salad greens. If you don't have a salad spinner you can dry the lettuce on paper towels. Snap off ends of asparagus. Roll cut asparagus into 1 inch (2.5 cm) lengths. Fill a large saucepan half full of water and bring to a boil over high heat. When boiling, drop in asparagus and parboil for 2 minutes. In a bowl big enough to nicely hold the asparagus, mix soy sauce, sugar and sesame oil. Add asparagus and toss lightly to coat. Set aside to marinate for 15 - 30 minutes. Put soy sauce, vinegar and mustard in a small bowl and whisk to combine. 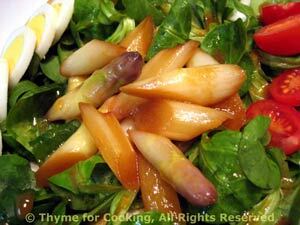 Put the greens into a bowl, add half of the vinaigrette and toss well to coat (a tongs works well). Taste and adjust, add more vinaigrette if you want. Divide the lettuce between two dinner plates. Peel and slice or quarter the eggs. Arrange the eggs and tomatoes around the lettuce. Divide the asparagus and arrange in the middle. 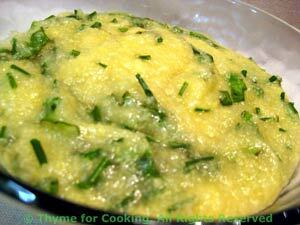 Serve, with any remaining vinaigrette on the side.